I have greatly valued the opportunity to interact with an inspiring and diverse group of high school students, undergraduates and teachers throughout my research career. I feel that emphasizing science as a process in which all can participate is critical for improving scientific understanding in the world outside education. Thus, guiding mentees through their own research projects and encouraging their growth as scientists has been one of the most rewarding aspects of research for me. As I have benefited from quality mentoring, I strive to provide opportunities for aspiring scientists to explore their own interest in biology. I emphasize self-efficacy in mentees by providing a supportive yet challenging research environment, establishing expectations, and acknowledging successes as they become more and more independent. The unique perspectives, life experiences and ideas brought by all of these mentees while we worked together have greatly enriched our projects. Bibiana spent the summer at KBS through the NSF-funded REU program. She developed a project investigating the importance of niche complementarity for aboveground and belowground switchgrass production. We planted several cultivars of switchgrass either in monocultures or polycultures, and varied the soil texture and fertility from conditions typical of marginal to fertile sites. Peter participated in the Undergraduate Research Apprenticeship program through MSU, and is a Biosystems Engineering student. He helped collected trait data on specific leaf area for multiple switchgrass varieties grown in a common garden, and helped with many other lab and field projects. Matthew was part of the Kellogg Biological Station's REU program. He worked on a project documenting effects of drought and fertilizer application on the cell wall composition (hemicellulose, cellulose and lignin) of switchgrass cultivars. He continued this research at KBS in the summer of 2016, developing his results into a poster he presented at the Ecological Society of America Annual Meeting in Fort Lauderdale after earning a SEEDS Travel Award. I served as a co-mentor for Fernando's REU project at the Kellogg Biological Station, which examined the response of spatial heterogeneity in pasture grasslands to grazing. Jacob worked on his Senior Individualized Project in the Gross lab, focusing on trait variation within and among switchgrass varieties. We compared inter- and intra-specific variability in many ecophysiological traits of grasses considered for biofuel production. Ashley joined the Gross lab research group as part of a Research Experience for Teachers funded by the Great Lakes Bioenergy Center. We examined soil communities and arbuscular mycorrhizae in biofuel crops, particularly switchgrass. Ashley also developed a new classroom module based on our research project to teach her students about soil organisms and plant growth. Gross Lab researchers Karen, Matthew, Katie, Jacob & Austin (left to right) at the 2015 Summer Symposium. Austin was part of Michigan State's Undergraduate Research Apprenticeship (URA) program, designed to give undergraduates an early taste of research along with enrollment in summer courses. He helped with many different lab research projects. He also completed independent work measuring the cell wall components of six switchgrass cultivars. Katie was also a URA student, and she worked on a project comparing plant growth with mycorrhizae inoculum from different biofuel fields. 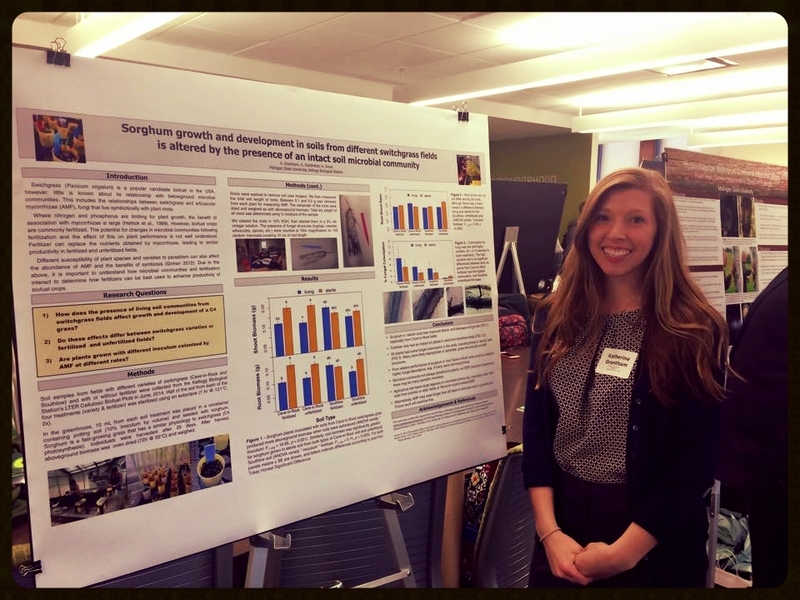 She presented that work at an undergraduate research symposium at MSU, as well as at a national meeting for all scientists working with the Great Lakes Bioenergy Research Center in May of 2015. In the summer of 2015, Katie continued helping out with research projects and mentoring this years' URA cohort. Cassidy conducted a summer project through the College of Creative Studies Summer Undergraduate Research Fellowship (SURF) program. His work expanded my survey of plant composition associated with dead trees to encompass two additional sites and also assessed how the removal of aboveground wood changed the trajectory of the plant community following tree death. Kimberly developed an independent project examining arbuscular mycorrhizal fungi (AMF) colonization of three year old native grasses that were planted either in the oak understory or open grassland. She also worked with me to develop a protocol for identifying dead oak trees using wood anatomy, and completed all of the microscope work related to that project. Both Kimberly and Cassidy were co-authors on with me on a paper recently accepted into Ecology that combined data from both of their work in the lab. Maureen Isaacs, expert in root elutriation (Feb 2012). Undergraduates at UCSB also helped with research projects for research credits in their home departments. They helped in the field when possible, weighed biomass, sorted litter decomposition samples, measured root:shoot ratios on greenhouse plants, set up root elutriation samples and performed countless soil analyses. Orlando was a high school student who joined the D'Antonio lab through UCSB's Summer Pre-College Research Mentorship Program, run through Summer Sessions. His independent project compared soils underneath valley oak trees and in open grassland at four sites throughout California. He learned a variety of soil analytical techniques, and helped with a litter decomposition study in the field. At the end of the summer he participated in a final poster symposium. He went on to enroll at UCSB following graduation. Gordon was also a high school student who spent a summer doing research through UCSB's Apprentice Researchers Summer Program (run by the California NanoSystems Institute). This program pairs students interested in science with mentors at the university. Gordon completed an independent project also looking at soils under oak trees, comparing deciduous and evergreen oaks at a single site. He gave an oral presentation at the completion of the program. He attended UC San Diego after graduation.